Part 2: As the manager of a Pet Hotel for several years I have some insight and tips to help you save money and find a good safe place for your pet to stay. note: if your dog gets sick, in most cases, it’s not the kennel or managers fault, just like it’s not the Principles fault if your child catches a cold from another student. It is part of being a dog owner. 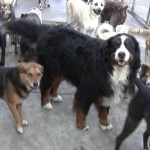 Boarding dogs can get very expensive, if you have more than one dog or you are a frequent boarder ask for a discount. You never know unless you ask. I would give discounts to military, seniors, students or people who were going to causes I thought were worthy of a discount. Ask what dog food they feed, or ask if you can bring a special diet and do they charge extra for that? Buying a good dog food in bulk can get very expensive, so don’t expect the best quality food at the kennel, although kennels are now paying attention to what the costumer wants. With some dogs, switching dog food abruptly can cause intestinal problems. In our facility we had a great track record with No bloating problems and only a small percentage of dogs having loose stools because of the food change. If your dog has been on the same food all it’s life, you probably want to bring your own food. If your dog is accustom to a variety of foods, or a variety of high quality food, they probably wont have a reaction. My perceptions is, going from a low quality food to a high one usually causes the loose stools, I don’t find it happening as much the other way. Do they do anything to help calm dogs nerves like having a T.V. on during the day (not animal planet). Air fans or a ticking clock during the day or night which helps drown out other dog or outside noises. A few other questions you might ask is what Vet do they use, is someone there at night and do they have an evacuation plan? If you have any questions or comments for me, please fill out the comment form.